The Joker is arguably the most famous comic book villain of all time, primarily serving as Batman’s arch-nemesis, but also causing trouble for many other heroes in the DC Comics universe. Other than his psychopathic mirthfulness and love of purple suits, one of the things that distinguishes the Clown Prince of Crime from many other baddies is how most of his pre-white skinned, green-haired life is shrouded in mystery. 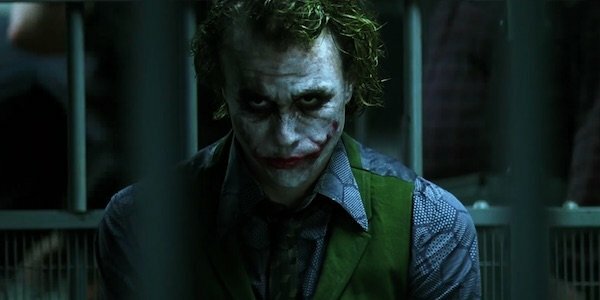 Christopher Nolan kept this intact for Heath Ledger’s version of The Joker in The Dark Knight, but comedian and famous geek Patton Oswalt has an in-depth theory speculating that before he came to Gotham City to spread chaos, the criminal mastermind was a military intelligence operative specializing in interrogation. Having recently re-watched The Dark Knight, Patton Oswalt noticed that The Joker was particularly skilled at “the kind of mind-fuckery that sustained, professional interrogation requires,” specifically by altering his personality and methods depending on who he’s talking to. Examples of this include when Joker mentioned he knew a squealer when he saw one, how he mocked Michael Jai White’s Gambol, when he appealed to Harvey Dent’s need for fairness and, arguably most importantly, when he turned the tables on Batman during the interrogation and attempted to goad the Caped Crusader into breaking his one rule. While Joker’s most popular origin story in the comics saw the character becoming his maniacal self by accidentally falling into a vat of chemicals, The Dark Knight eschewed that in favor of the main antagonist simply donning face paint and dying his hair. The villain gave conflicting stories about how he got the scars on his face, but that’s the closest we came to learning about his past. Still, given Joker’s talent with manipulation and his considerable knowledge of weapons and explosives, it’s entirely possible that he was an interrogator for the military in his previous life, and after witnessing one too many horrors of war, he snapped and became a cackling anarchist. Because of Heath Ledger’s passing on January 22, 2008, six months before The Dark Knight was released, we never got to see more of what the actor could have done with the character. The Dark Knight Rises ended with Bruce Wayne saving Gotham City from being destroyed and retiring from his life as Batman, but we never learned what happened to The Joker after he was apprehended by the authorities at the end of The Dark Knight. As far as we know, he’s still locked up in Arkham Asylum in this universe, so if he escapes, it’ll be up to John Blake, Gotham City’s new vigilante protector, to stop him. Stay tuned to CinemaBlend for all the latest in Batman-related movie news, and be sure to look through our handy guide to learn what DC movies are in development.